Hi all. Hope you’ve had nice weekends so far. I’m sorry to be posting these links so late, but I hope they might give you some good reading material as you charge into the work week! These elegant apples with roasted beet tartare, cashew cheese, and candied walnuts from Ketty of the Luminous Vegans have my name written all over them. So pretty. 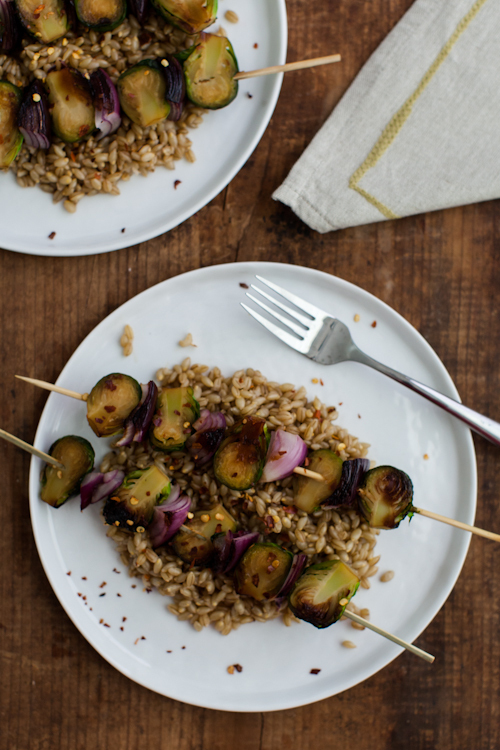 Ella’s marinated brussels sprout skewers with ginger barley pilaf look perfectly seasonal and simple. Speaking of seasonal, looking for a seasonal raw dessert? 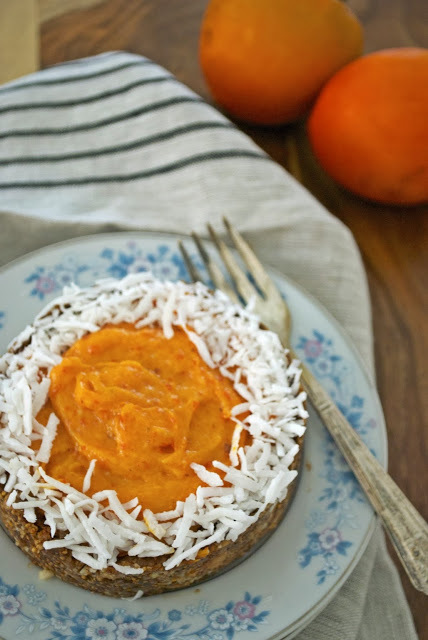 Look no further than Marquis’ persimmon cakepie. 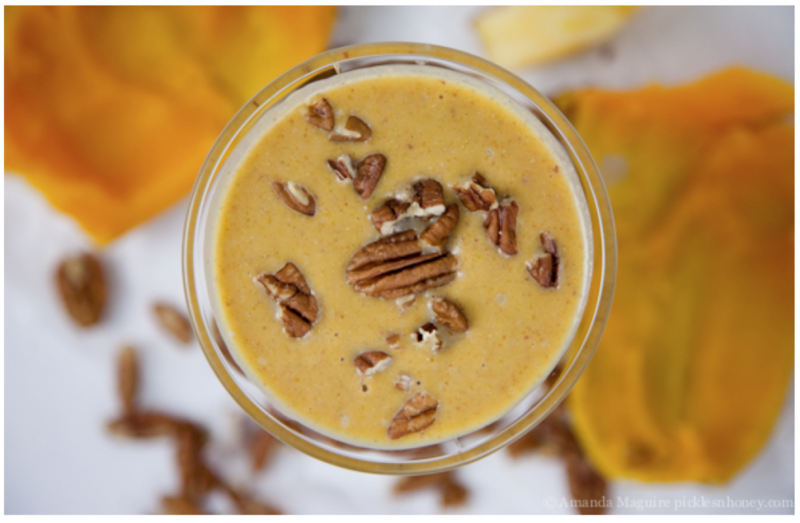 If you’re maxed out on pumpkin smoothies, but you’re still craving an autumnal morning drink, check out Amanda’s lovely spiced apple butternut squash smoothie. 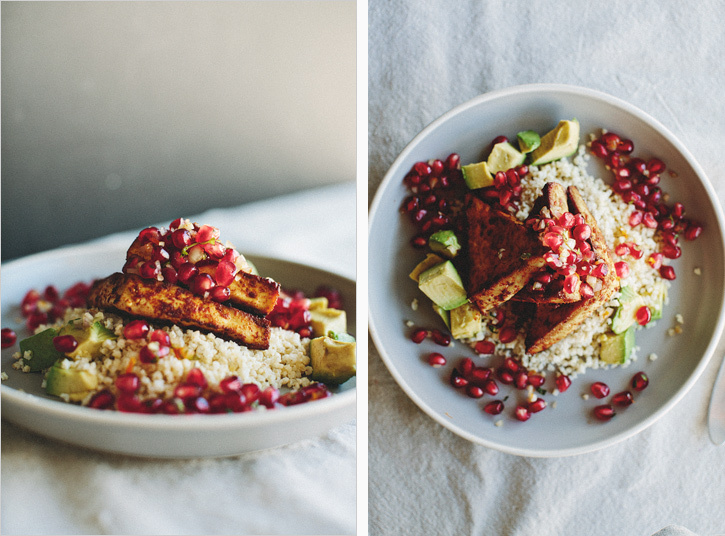 Sarah’s chili roasted tofu with minted pomegranate relish is beautiful to look at, full of texture, and incredibly nutritious. What a lovely plate of food. 1. Thanksgiving is (amazingly) right around the corner. If this is your first vegan (or plant-centric) holiday and you’re feeling a little nervous, check out Cadry’s 12 very excellent tips for surviving your first vegan Thanksgiving. 2. This week, as you probably heard, the American Heart Association and American College of Cardiology issued new cholesterol guidelines that have now make many more Americans (millions more) will now be eligible and possibly advised by physicians to start taking statins. Statins, such as Lipitor and Zocor, help to lower cholesterol. 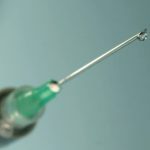 They’re often very effective in treating heart disease, but the new guidelines are controversial, and many people, including a number of health professionals, believe that reliance on statins may engender a false sense of security in patients (which is dangerous, since statins are not always effective on their own) and take attention away from an emphasis on lifestyle change as a means of preventing and reversing heart disease. I was very interested in this highly skeptical op-ed by two MDs in the New York Times. 3. 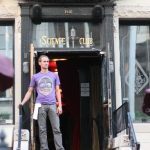 For coverage of the new guidelines that brings in perspectives from both sides, check out this episode of the Diane Rehm show. While I basically agree that the new guidelines are problematic, I did appreciate hearing the perspective of physicians who note that it’s hard for them to educate patients about healthy living in the context of contemporary medical practice. How can physicians initiate conversations about healthy diet and exercise when they’re struggling to see huge numbers of patients in woefully limited time? Clearly, this is a systemic problem, and the solutions won’t be simple. 4. While we’re chatting about health, I really enjoyed this article, via Discover, about prehistoric evidence of cancer. While we tend to think about cancer as only a contemporary scourge (and certainly its prevalence is steeply on the rise) the disease has also been a part of the human condition since, apparently, the Pleistocene era, a million years ago. This is also a point made quite brilliantly by Siddartha Mukherjee in The Emporer of All Maladies–a rebuttal of the notion that cancer is exclusively a modern disease. 5. Nine days ago, my friend Jasmin’s beloved grandmother, Sherrey Glickman, passed away. Jasmin and her grandmother were exceptionally close, and part of their bond was the fact that Sherrey had gone vegetarian at the age of eighty-six. She wrote a very touching blog post for Our Hen House called “Never Too Late to Change the World: Why I Became Vegetarian at Age 86.” It’s very inspiring, and if you’re so inclined, I highly recommend it. And speaking of loss, I wanted to give a special mention to this post, written by my friend Kathy, about the loss of her cat, Nelly. 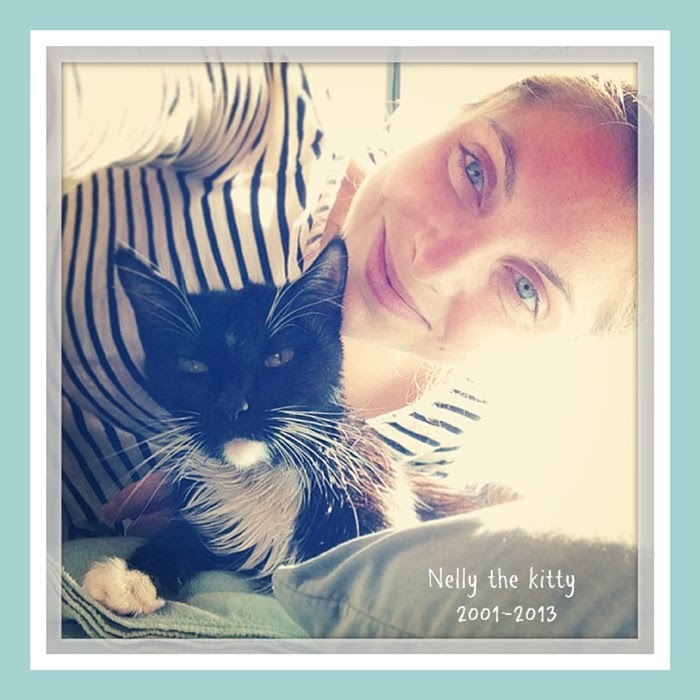 Nellycat was a huge part of Kathy’s blog, and her presence, I know, will be missed by all Healthy Happy Life readers. In spite of her devastation, Kathy is still producing beautiful words. My heart goes out to her, and I’m sure that other readers are also sending her love and good thoughts. So. A somber assembly of reads this week. Tomorrow, back to food, as usual. I love this segment you do!! All those recipes look so enticing! 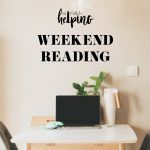 Just wanted to drop a note to say that I ADORE the Weekend Reading posts. And that I made your hemp protein hummus a few days ago, and it was OUT OF THIS WORLD with crudités! It has been keeping me well-fueled in the midst of NaNoWriMo. You are, by far, my favorite blog. I hope to see a book from you someday. Or two! P.S. How can anyone ever get maxed out on pumpkin?! I am SO glad that you like weekend reading Rachel!! It’s been so fun to assemble this series so far. And as for a book, stay tuned 🙂 It’ll happen, I promise. For now, good luck with NaNoWriMo and I hope you continue to enjoy the series. And I second the request for you to write a book! Amy, yay! I’m really excited that so many folks are loving the series. I’m relishing the process of putting them together. Really glad that you’ve been sending some love/support to Kathy as well. 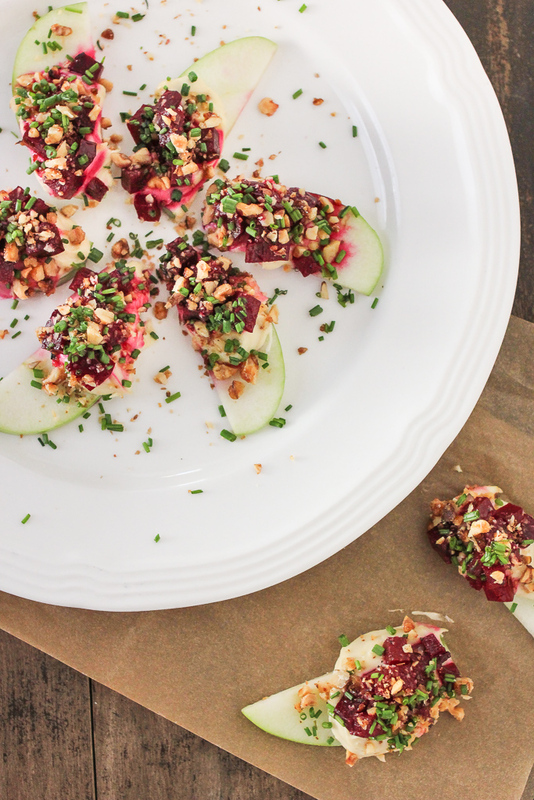 wow the apples with roasted beet tartare, cashew cheese, and candied walnuts looks so good and festive! can’t wait to make it! I can’t get enough winter squash, so bring it on. Hey G! Great post. As always, the food looks beautiful and delicious. “How can physicians initiate conversations about healthy diet and exercise when they’re struggling to see huge numbers of patients in woefully limited time?” I think this is exactly right, but I’d also add, that most physicians are not trained in any form of nutrition and are therefore also not adequately qualified to give nutrition counseling to most patients. At Georgetown, and at many (if not most) other med schools I’ve looked into, there’s at least a little bit of nutrition training (albeit limited to a couple of lectures, a short elective, or even a single lecture). It’s inadequate, though not quite nonexistent. 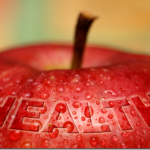 I would note, though, that I’ve been really surprised by how many of the doctors I meet are pretty nutrition savvy and aware of lifestyle choices that would help patients at risk for chronic disease. But it seems that they simply don’t know how to integrate that savvy into their practice, since there’s often little precedent or framework for it. This, coupled with the incredible time pressures, means that it just doesn’t happen. I’m hoping that the new debates over statins will actually help to raise more consciousness about this, so a systemic shift can happen. Lovely collection of recipes–those apples look especially beautiful! Wow, I’m loving these posts! Love that you put both sides of the statin equation here. But I’m still not a fan of the new “rules”. And, I just read the article over at Our Hen House. How amazing! Saw them speak this weekend and was weirdly too shy to say hi and ask questions, but loved the passion and intelligence of their presentation. Thank you so much for sharing my appetizer. There are so many dishes here that sound lovely. That persimmon cakepie sounds delicious. I never know what to do with persimmons other than just to eat them straight. That is really sad news about Kathy’s cat Nelly. I have not lost a pet yet, but I have two pups of my own and I can’t even imagine the pain of losing them. I’m really enjoying your weekly line-up of things that I might have missed around the internet, Gena! Thank you so much for including my post on celebrating one’s first vegan Thanksgiving. As a fellow cat lover, Kathy’s post about Nelly really choked me up. Animals become so combined with what it means to be “home,” that it is hard to redefine our lives without them when they’re gone.